I'm just back from a very productive weekend of Birding at the Edge. The Edge of Appalachia Preserve in Adams County, that is. 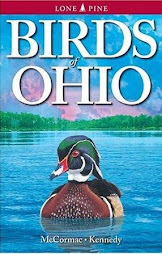 The Ohio Ornithological Society, along with partners the Cincinnati Museum Center and the Ohio Chapter of The Nature Conservancy, organized a two-day foray to see birds. Lots of birds. Ground zero for our operations was the spectacular new Eulett Center - above - which looks out over the Ohio Brush Creek valley. This event was limited to 22 people, and we divvied up into two teams. Scouring Adams and Scioto counties over the past day and a half, we found 102 species, and all but one was a local breeder. Not bad, considering that probably not many more than that breed in that region in total. Major thanks go to Cheryl Harner of OOS, for her incredibly competent logistical work; Ned Keller for leading the other team; Marc Nolls, and Greg and Leslie Cornett for helpful support; and Chris Bedel, Mark Zloba, and Pete Whan and Lucy Miller for lending their fab field skills and the use of the Eulett Center. We didn't have to go far this morning. Here's our group, standing at the bottom of the driveway to the Eulett Center. Some really great birds are easy pickings right here. And it's nice to bird in a place where there is next to no traffic! Early morning fog mists the fields along Ohio Brush Creek, creating a slightly surreal scene. That is primo Blue Grosbeak habitat, and indeed one is teed up on the tip of that roundish tree in the middle of the field. We watched it sing away through the scope for quite some time. A clownish Yellow-breasted Chat amused us with its antics, as it hooted, grunted, squawked, and made machine gun sounds. At times, the chat would perch on the roadside wires, and we were witness to its amazing flight display, in which this most unwarblerlike warbler flutters into the air, legs a dangling, offering up all manner of bizarre vocaliations. 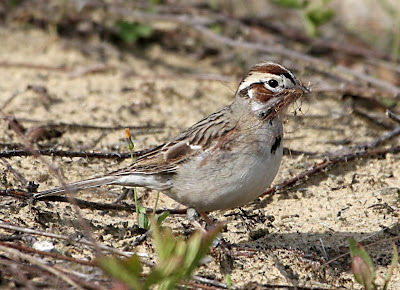 To cap it, we had great looks at three Henslow's Sparrows lurking in the field. Out popped this freshly washed female Prairie Warbler, and she preened herself back to order about 20 feet from our group. Prairie Warblers are a dime a dozen in this area, and their fast-pitched rising scales are a regular part of the avian symphony. After sating ourselves at Eulett, we traveled a short ways to an abandoned bridge over Ohio Brush Creek. This was an excellent spot, and among other goodies we had a gorgeous Yellow-throated Warbler singing from a sycamore snag, and he had the good manners to stay put long enough for us to admire him through the scope. The main reason we came here was to observe a colony of adobe-building Cliff Swallows. From the old bridge, we were at eye level with the new bridge and the swallow colony. A buffy-rumped swallow zips into one of the mud huts, which are engineering marvels. As a finale, an exceedingly tame Northern Parula flew from the adjacent silver maples and alighted on one of the bridge support struts. And this was only our second stop! We went on to see many other birds, such as 1st-year bearded Orchard Oriole singing nearly side by side with a fully adult male; a stunning male Summer Tanager, Red-headed Woodpecker; another Blue Grosbeak; Grasshopper Sparrow; an out-of-season Ring-necked Duck and many others. Thanks to all who participated in the Birding at the Edge event, and it looks like this may be one to repeat next year. I'm down in southern Ohio helping to lead trips for an Ohio Ornithological Society breeding bird workshop. We're exploring Adams and Scioto counties, and this landscape includes some of the state's best wilderness lands. I'll post more about this foray later. We've done well thus far. Our group list stands at about 95 species, nearly all of them local breeders. Chuck-will's-widows on the nest has certainly been a highlight, but we've seen lots of other great birds. And other stuff. Eastern Fence Lizard, Sceloporus undulatus. A lot of Ohioans are probably somewhat surprised to learn that we have lizards in the state. Rest assured, we do, and the chap above and his brethren are locally common throughout much of southern and eastern Ohio. Fence Lizards prefer dry slopes and openings, and spend much of their time on the ground. Spook one, and they're prone to running up a tree trunk, and the animal's upper body matches tree bark well. We spotted this one in Shawnee State Forest scampering across a road. Chris Bedel was able to leap from the car in time to run it down and make the capture so that our group could admire it. This is a big, old lizard - at about 6 inches in length, it approaches maximum size for the species. Something you won't see everday - the ventral - underside - surface of a Fence Lizard. The mature males develop this fantastic iridescent scaling on the belly, and it is incredibly showy when the sunlight glints off the beast. I suspect they flash this coloration at the females in a bid to impress prospective mates. It may also serve to help startle potential predators, but I am not really sure why exactly they are so richly tinted below. Today was one of those magical days afield where we kept seeing one interesting thing after another. While Chris was handling the lizard and showing it off, a particularly pugnacious Hackberry Emperor butterfly roared in and landed on his hand, making for a good shot. Shawnee State Forest was a blizzard of butterflies today, and Hackberry's were everywhere. The road less traveled, in this case through a beautiful northern forest near the shore of Lake Huron, in northern Michigan's Presque Isle County. A very special plant is common here, and we were indeed fortunate that our recent birding and botany foray here coincided with peak bloom for this extremely range-restricted species. In places, Dwarf Lake Iris, Iris lacustris, carpeted the thin limey soil in a riot of purple. This plant is a true showstopper, sure to grab the eye of even the most botanically jaded. Small wonder the state of Michigan designated this iris as the official state wildflower. A truly sophisticated choice, as not only is this one of the showiest plants in the Great Lakes region, but Michigan also supports the bulk of the total population. What they lack in stature, Dwarf Lake Iris makes up in beauty. The "Dwarf" in the name is well placed - they only stand six inches or so in height. It occurs in perhaps a dozen counties in Michigan, all along the shores of lakes Huron and Michigan, and the tiny iris doesn't stray more than a stone's throw from the shoreline. The word lacustris - the specific epithet of the plant's scientific name - means "of lakes". Populations are scattered and local. There are a few populations along the Wisconsin shore of Lake Michigan, primarily on the Door Peninsula, and perhaps a few sites on the Bruce Peninsula of Ontario, Canada. That's it. We were especially fortunate to see a small number of a white-flowered form, and they were quite striking. I am hopeful that they come up again next year - I'm sure they will - so that our group can once again admire them. This is a plant that had long fired my imagination, and was high on my botanical wish list. It was very gratifying to finally get to see Iris lacustris on its home turf - the cool rocky limestone pavements along the wild boggy shoreline of northern Lake Huron. Strolling the trails and beaches of the Lake Huron shoreline in Presque Isle County, Michigan is an excercise in constant distraction. There are all manner of birds, and one must generally keep their eyes elevated to spot those. But looking up is tough when plants such as Yellow Lady's-slippers, Cypripedium parviflorum, are quite literally roadside "weeds" in places. The individual in this photo is a gem of an orchid; an unusual double-flowered form. Coming from Columbus, Ohio - the land of invasive bush honeysuckles - it was nice to see some of the native honeysuckles. This is Wild Honeysuckle, Lonicera dioica, a plant that is becoming scarce down here but remains common up there. Most of the flowers that I saw were this striking deep red-orange color; most that I see in Ohio trend towards yellowish. Brilliant yellow-orange flowers of Plains Puccoon, Lithospermum caroliniense, stand in stark contrast to the white sandy dunes of the Huron shore. The low shrub in the back left is Ground Juniper, Juniperus communis var. depressa. And the darker low-growing mat to the right of that is a most interesting little heath - Bearberry, Arctostaphylos uva-ursi. Bearberry is a beautiful little shrublet that is very common in sandy ground throughout the northern Great Lakes and far beyond. Ohio lies at the southernmost limits of its range, and there are but two old records in our state, along the shores of Lake Erie. The tiny flowers dangle in pendant clusters, and are urceolate or urn-shaped. Like tiny ewers with mouth tinged pink, they demand a close inspection once noticed. The evergreen leaves are thick and coriaceous - leathery - and it's hard to see how a caterpillar could or would chomp into them. But at least one noteworthy cylindrical bag of goo does indeed make Bearberry its meal of choice. I was excited to see many of these quarter-sized butterflies frequenting gravelly openings near Bearberry patches, and upon my first good look at one, saw that they were elfins. But not an elfin that I had ever seen. It didn't take too long to ferret out the name: Hoary Elfin, Callophrys polios. Small wonder we were in elfin city - these mites require Bearberry as a host plant, along with another heath that was very common, Trailing Arbutus, Epigaea repens. Good thing their caterpillars have evolved to eat these tough heaths, and thus transform into the elfins that add a real dose of lepidopteran excitement to the sandy plains. During my recent foray into the north woods of Michigan, we visited an interesting site loosely known as the "Underground River". That's it, above, when not under the ground. This is karst country, and the underlying limestone is prone to patchy erosion. Sinkholes are common, and in places this stream disappears into the ground only to resurface elsewhere. There are points when you can hear its rushing waters in the subterranean depths through fissures in the ground. Pretty cool stuff, and breathtaking scenery. We had a Winter Wren here, singing its impossibly complex symphony of trills, and many other interesting birds. Gay-wings, Bunchberry, Rose Twisted-stalk, and Striped Maple added botanical allure. But it was a dragonfly that was my personal highlight at this spot. Sharp-eyed Nina spotted this freshly emerged dragon on a young sapling, some 30 feet from the river. It is a Twin-spotted Spiketail, Cordulegaster maculata, and it still clings to the exuvia from which it emerged. 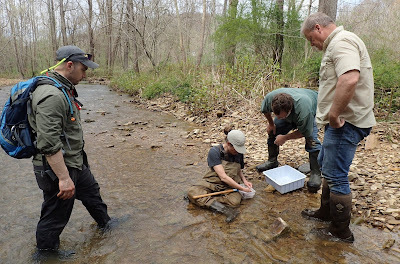 It had lived a long time as a nymph - maybe a few years - in the swift stream, capturing tiny macroinvertebrates and whatever else it could grab. The night previous to our visit, the dragonfly nymph responded to some internal stimulus, crawled from the stream and through the woods, and lodged on this plant. In a miracle of transformation, it burst from the confines of the exuvia, and slowly morphed into the beautiful spiketail that we see here. Spiketails inhabit fast-flowing streams with ample forest cover along the banks. As this one matures, its eyes will become a brilliant emerald green, and it is quite cool to encounter an adult coursing low over the creek like a mini B-52 bomber. When they fly through a sunny opening, those eyes gleam like neon glow lights, visible from quite some distance. Nestled on the shores of Nettie Lake in a remote corner of Michigan's Presque Isle County is NettieBay Lodge, a truly fabulous place for those who cherish nature. The property is expansive, covering some 2,200 acres, and we could have a bang-up time without ever setting foot on other lands. But we wandered. Not far and wide, though - the 130 species of birds, numerous other animals, and more cool plants than you can shake a stick at were all found within a one-half hour drive of NettieBay Lodge, our base camp. I was there to lead field trips as part of the "Birds & Botany Weekend". We prioritized birds, switching more to plants and other natural history as the day progressed and birds became quieter. I'm going to blog some of the ultra-cool plants that we found later, and already have mentioned a few if you look at earlier posts. Next year, we're adding an extra day - one and a half days went far too fast! - and tack on a trip to the extensive dunes and beaches of nearby Lake Michigan, where we will ooh and aah over impossibly cute Piping Plovers. Our group, and a fine bunch they were. From L to R: Nina, Craig, Dawn (in green), Christine, Jean, Tony, Helen, Vinny (brown cap), Stan, and Richard. Christine was our host and is events coordinator for the lodge, and because of her things went perfectly. Her mother is the cook, and the food was to die for! I want to single out her two boys, Tony and Vinny. They are the coolest kids that you'd ever want to meet, and at age 8 and 9, respectively, are becoming outstanding naturalists. We brought one or both on all of our trips, and with their sharp eyes and tremendous curiosity, they found many interesting things for the group to look at. 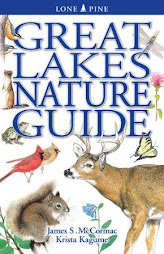 Nature Deficit Disorder would not be the problem that it is if every kid had the opportunity to spend time in northern Michigan looking at Dwarf Lake Iris, tiny Hoary Elfin butterflies, loons on every lake, beavers swimming about, and porcupines waddling across the road. It was cool hanging with you guys, Vinny and Tony, and we'll do it again next year! The lodge and cabins are perched on the shore of this pristine lake, and a glance to the right will bring this Osprey nest into view. Every telephone pole should be similarly adorned. The male stands guard nearby, looking a bit wet and bedraggled after a fishing excursion. Probably every lake of any size up here has its resident Common Loons, and Lake Nettie had two pairs. This nest was on a small island a few hundred yards offshore from the lodge. These loons are thoroughly acclimated to people, and we took a short boat ride out to admire them. One of the birds would feed and swim near the boat, and I am told they'll occasionally swim so close that you can watch them under the water. The other was minding the nest, allowing for nice photo ops. Nina and Rick had the big lens, and I can't wait to see what they came up with. While loon-watching is fun, hearing their extraordinary yodels may be even better. Birds of the north abound, and Purple Finches are everywhere. The males look as if they have been dunked in raspberry sauce, and sing incredible warbling serenades. In addition to finches, some of the cool birds that could be seen or heard from the lodge deck included Ruffed Grouse, American Woodcock, Barred Owl, Red-headed Woodpecker, Yellow-bellied Sapsucker, Blue-headed Vireo, Red-breasted Nuthatch, Hermit Thrush and Veery, Nashville, Chestnut-sided, Black-throated Green, and Pine warblers, Scarlet Tanager, and Rose-breasted Grosbeak. Everyone loves a warbler, and we found 23 species, most of them on their breeding territories. The warbling included Kirtland's Warblers within a short drive of the lodge! On Saturday evening, we took a few minute drive down the road to admire a pair of American Bitterns. Here, the group is watching a bittern perform its odd, comical call. While every marshy spot and glacial lake seemed to have its resident bitterns, Nina and Rick spotted this pair as we drove by and they were still right out in the open when we went back after dinner. American Bittern imitating a cattail. They're very good at not being seen. This bird eventually began to strut its stuff right before our eyes, gulping in air and belching it back out to create a sound similar to a pump being run under water. We already have dates set for next year's adventure: May 19th thru 22nd, 2011. Space will be VERY limited. If this sounds like a trip that you'd be interested in, please contact Christine Baideme at NettieBay Lodge. I'll guarantee you won't be disappointed! Fringed Milkwort, or Gay-wings, Polygala paucifolia, Presque Isle County, Michigan. One of myriad interesting wildflowers in this remote and sparsely populated corner of the upper Lower Peninsula. Our crew had tons of great birds today. We just returned from watching and listening to scores of Whip-poor-wills, some of which were hunting on the road and treating us to their luminescent red eye shine. Just before that, we watched an American Bittern "singing". This morning, we were treated to Kirtland's Warblers singing at close range, a hybrid Brewster's Warbler paired with a female Golden-winged Warbler, Black-billed Cuckoo, Lincoln's Sparrow on territory, Bobolinks, and about 90 other species. If you've not been up here, you really must visit. We'll be doing this workshop next year in late May and it'll be every bit as good. For info about NettieBay Lodge, GO HERE. Today we entered a true botanical paradise; a land of eflin flora and rare specialists. Hard on the shore of Lake Huron, not far from Roger's City in Presque Isle County, Michigan, is some of the coolest habit on the Great Lakes. Limestone pavement juts to the surface in places, forming alvars. In between are cool, wet cedar and spruce swamps and everywhere there are interesting plants. We saw far too many things to list right now, but below is one of the coolest of today's finds. Ram's-head Orchid, Cypripedium arietinum. One of our smallest orchids, this lady's-slipper can be devilishly hard to spot in the gloom of the wet boreal forests that it inhabits. They apparently are not common here, and we found but two plants. I had a vibe about some particularly interesting habitat, and dropped into the woods and found these plants. What a treat. This was a life orchid for me, and so it will be for the rest of the group when we take them to have a peek. Yellow Lady's-slipper, Cypripedium parviflorum, will not be such a challenge - it is literally a roadside weed in this area and we saw hundreds. I arrived in this incredible northern Michigan county last night, and spent the day today scouting for birds in preparation for some upcoming field trips. I'm here to work with the Nettie Bay Lodge, and a more beautiful place to stay could not be found. Within earshot of my cabin are yodeling Common Loons, singing Whip-poor-wills, dancing American Woodcocks and so much more. Jack Pine country, and this crop is of just the right age to support Kirtland's Warbler. I stumbled into this area, only about one-half hour away from the lodge and far north of the traditional Mio/Grayling sites where most people go. There were four territorial males right here, along with beautiful territorial Clay-colored Sparrows and many other species of the sandy pine plains. The main highway in this area, and typical of the roads up here. Next to no traffic! While taking the photo above, an American Bittern was gurgle-pumping right next to me, in this beautiful glacial lake. Such habitat is common here, and all of the lakes and wetlands have bitterns. And in many cases, Common Loons. Within a half-hour drive to the east is Lake Huron and some truly spectacular habitats. We were over there this morning and found so many cool plants, birds and insects I can't even begin to describe everything. The beaches on this part of Huron are rocky cobble and quite showy. You are viewing this cobble through about two feet of water. The waters of the lake are absolutely crystalline. A boldly patterned male Lark Sparrow stands proud, as if modeling for Bruce's lens. No shrinking violet Le Conte's Sparrow types, these harlequin-faced beauts. The female of the pair gathers rootlets for nesting material. Given where these birds were, chances are good that some of that vegetation is listed as endangered or threatened. But we'll cut her some slack - these Lark Sparrows of the Oak Openings are the easternmost breeding population. In a remarkable display of multitasking, we saw the male mount her several times - while she also held a mouthful of nesting material. Efficient little devils, I'd say. Thanks mucho to Bruce for sharing his fabulous work with us. I've got an uninvited but not altogether unwelcome tenant on a dark corner of my basement. It's a spider; specifically a House Funnel Weaver, Tegenaria domestica. I call him Ed, even if it is a female. Ed in his lair, in a dank intersection of concrete blocks behind my dryer. He's a bit of a celeb in the spider world, as a photo that I took of him last year made it into the new Division of Wildlife spider booklet (p. 15). That's right - last year. These funnel weavers can live a long time, and I first photographed Ed on November 29, 2009, and he'd been around for at least a month or two prior to that. During the day, you'll generally not see hide nor hair of Ed. Come nightfall, and he ventures to the mouth of his funnel retreat. The flash of my camera seems not to bother him one whit, and I got these images last night. The capture sheet in the foreground has become a thick, lustrous mat strung between the two cellar walls, as funnel weavers continually add to it. If you are a bug unfortunate enough to fall into the web, watch out! Quick as a wink, Ed'll dart from that tunnel and toxify you with a venomous bite. One of these days I'll have to capture a cricket and toss it in and video the outcome for your viewing pleasure. Lest you think me an odd spider-charmer, I'm really not. Ed or his kind probably wouldn't be allowed to take up occupancy in the neat and clean upstairs rooms of my home. But he causes absolutely no problems in the subterranean level. In fact, as basements are a major hideout for all manner of undesirable nasties such as earwigs, silverfish, house centipedes, and other creepy-crawlies of the night, Ed probably does a tremendous service by routinely taking them out. Chances are good that you've got a funnel weaver or two in your basement. They aren't particularly large, nor do they command a lot of space. Might just consider letting them be, as they'll pay their rent by dispatching less desirable critters. The scene yesterday along Krause Rd, just west of Ottawa National Wildlife Refuge. We were looking for very distant Upland Sandpipers. At times, the best birding locales were absolute gridlock. That's fun for a while, but I desperately needed a break from the mobs today. Wild Lupine, Lupinus perennis, paints a sandy oak openings. 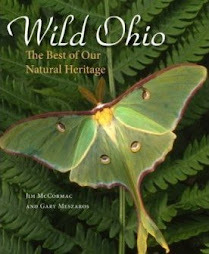 This rare - for Ohio - member of the pea family is the host plant for the endangered Karner Blue butterfly. So, it was off to the Oak Openings west of Toledo. These ancient dunes harbor some of the most interesting flora and fauna to be found anywhere in the Great Lakes region. And there are far fewer people. There are lots of tiny and obscure rarities to be found in the Oak Openings. This is one of them, and it may suggest a dandelion to you. And it is the Dwarf Dandelion, Krigia virginica, a threatened species in Ohio. A lover of open sands, it thrives in the Oak Openings but few other places in this state. A big one might stand a few inches in height, but masses such as above tend to draw even the eye of the botanically disinclined. While exploring the sandy barrens along Girdham Road, we were whooped at by this Great Crested Flycatcher. These cinnamon, gray, and lemon flycatchers are the only of their ilk to nest in cavities in the eastern U.S. They have the potential for a long life - one banded bird was found again, 14 years later. 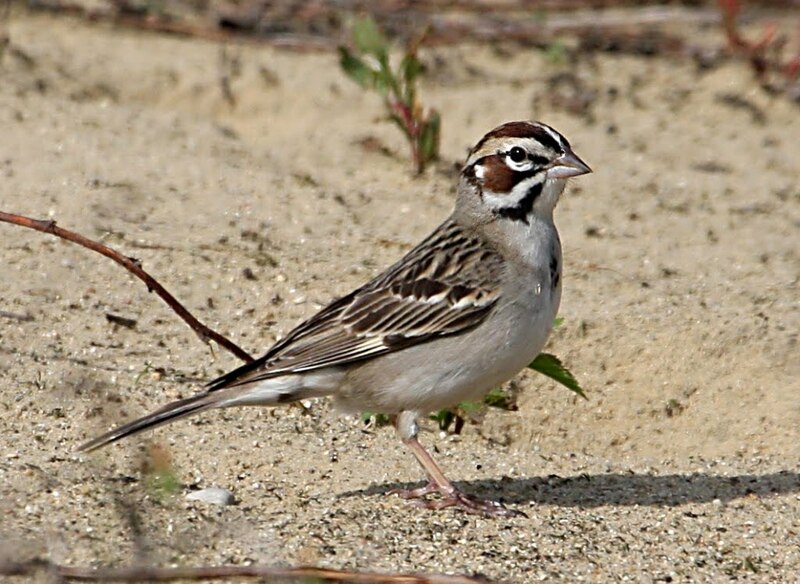 I was accompanied by two guys who had never seen a Lark Sparrow, which is one of the rarest breeding birds in Ohio. There are perhaps a few dozen pairs nesting in the Oak Openings, and they represent the easternmost breeding population. Big and showy, Lark Sparrows are relative extroverts in a family of skulkers. We had a pair nearly at our feet, completely ignoring us while they gathered nesting material. The bird above is surrounded by clumps of a rather rare native grass - Starved Panic Grass, Panicum depauperatum. This is the same genus of grass that gives us millet, and I noticed the sparrows were gobbling its fruit. I was excited to find this plant, although I suspect few others will be. While poking about on the sparsely vegetated fringes of some dunes, I noticed this tiny "weed" scattered here and there. It is Western Hairy Purslane Speedwell, Veronica peregrina var. xalapensis. Now that's a mouthful for a three-inch tall plant - about 20 syllables between common and scientific name! Ack! I had never seen this variety before, but remember Dr. Tom Cooperrider mentioning that it should be found in Ohio, years ago. So I've always given a bit more than a casual glance to purslane speedwells, especially in sandy habitats. Variety xalapense is named for Xalapa, Mexico, and is much more common to the west. I don't know its status in Ohio, or what if any prior records might exist. The typical variety of Purslane Speedwell is ubiquitous and widespread - I'm sure you've stepped on some plants at some point. After hearing an Alder Flycatcher sing while driving another road, we stopped and I noticed a patch of the common form of this speedwell growing in some roadside gravel. Sorry for the less than stellar photo - raging wind gusts - but you can see how smooth it is, quite unlike the copiously hairy variety in the preceding photos. So, lots of good birds and an interesting new speedwell. Not a bad day. New species of dragonfly discovered!